I installed the lamp 9 inches above the fuge section of my Trigger Emerald 39 sump. At this height I measured 843 PAR at the bottom of the sump and 2000 PAR one inch below the water surface. I ordered two tennis ball sized portions of Chaeto that had a combined weight of 91 grams at startup. My initial photo period was 8 hours then pushed to 24/7 on day 2 thru day 6. Nitrate and PO4 levels were super low at the beginning with my large remote DSB so can't comment on those. The PH spike I was expecting has yet to materialize. The fan is noticeable in a dead quiet room. My sump is in the mech room of my house so no issue. Like everyone else would like to have seen a dimmer on this. This light has grown chaeto amazingly well in my refugium. I position it 9” above the waterlevel for a 10 HR period opposite of my display. I have a heavily stocked & very well fed 175 gal reefer, using this light and chaeto, I have kept my nitrates at 1-2 ppm! Make sure to supplement iron (+ test) and iodine for maximum growth. Excellent product! I own a 200-gallon Mixed reef tank. It has Been up for 10 years. SPS was always just out of my ability to grow. I constantly was having issues with Nitrates and phosphates. I have a great skimmer, Biopellet reactor, Gfo, etc. nothing seemed to work. Went with the Triton method as seen on BRS TV. Mixed results because I was not getting very good Cheato growth. Then I went with the Kessil 380. complete change. I have a 16x16x12'' refugium chamber in my sump. I harvest a basketball size clump of cheato every Friday. My phosphate and nitrates are in the perfect zone for SPS. I can't say enough positive about this light. No more gfo, no more bio pellets, I have not done a water change in 6 months. I am growing SPS like crazy. I am so stoked with this light and the triton system6 months ago I bought a Walt Disney and JF Homewrecker sps. Both are growing like crazy. This light is the heart of my system. No other light comes close. I run this light over my cheato 24/7 at 1500 par. that is not a typo. I purchased this light from BRS 14 months ago. It was easy to install and I was hopeful that it would do everything people (BRS included) claimed. It grew macro algae well, but not much better than my previous refugium LEDs which were around 1/6th the price of this light. Moreover, It has only been 14 months and the fan in the light has stopped working which essentially means the light overheats very quickly and shuts off after less than one minute. 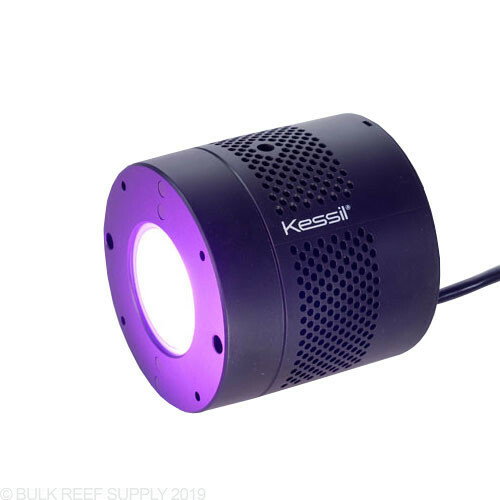 I realize the death of my light is from the saltwater environment, but I was very cautious when I got it and mounted it to avoid and problems For over $300, I would expect the light to function extremely well and to last more than 14 months. Essentially I wasted a huge amount of money thinking this light would be great, but it only performed slightly better than my previous cheap LEDs and it died after just over one year of use! Save your money and get something else. Great product. As soon as the light went above my refugium, it made a huge difference. My Chaeto just about doubled in the first couple of weeks. I've seen a vast improvement in the efficiency of the refugium with this light. I would recommend it to anyone looking to increase the growth rate of their Chaeto in their refugium. 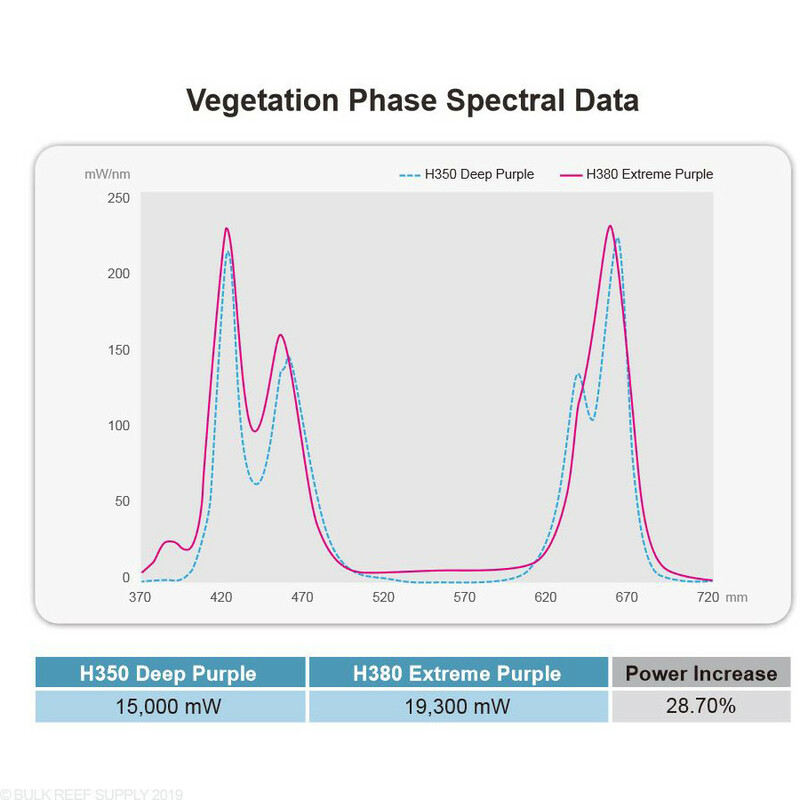 I will start out by saying I am a new reefer and am building a 250g system with a custom built sump to leverage the Triton Method that said I have a 35g fuge that is 30” long so I ordered two H380’s and an H series spectral controller that one would assume is compatible with the lights similar to the A360 and the A series controller and to my surprise they aren’t so if you need multiple lights for your fuge know an Apex or timers are in your future! This light packs a lot of punch, and very quiet while running. The spread is nice and more then sufficient for any sump. This was a game changer for me. 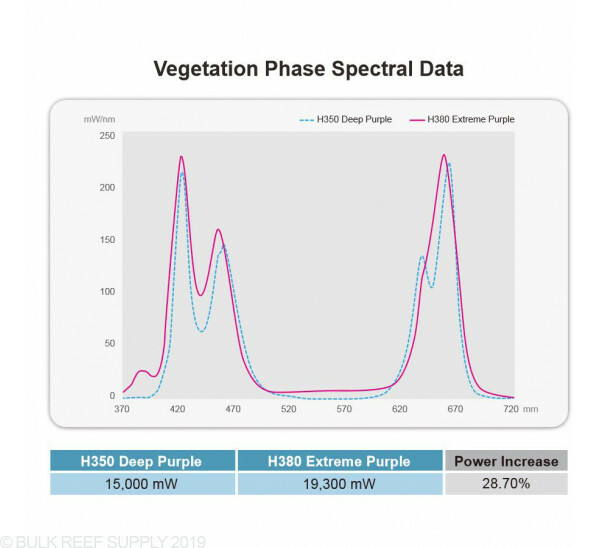 I use it on my Reefer Peninsula 500; Nitrates and Phosphates are consistently at 0 and less than 0.3 respectively. It does add some heat to the tank given the light is in the closed cabinet, but the addition of a small DC fan to keep air flowing in/out of the sump are fixed the issue completely. I recommend this light every chance I get. Because I have never had the best luck with growing macro in a fuge I was a little hesitant to spend $300 on a light. All I can say is wow, this thing grows chaeto like no other. I have been battling a little algae since getting lazy and needed to fight back before it got worse. I added this light along with a very small baggie of chaeto, and within a week the chaeto is almost he size of a volleyball. I have been running it 24/7 and my algae has stopped growing and will hopefully begin to go away soon. The only thing I don't like about the H380 is that it lacks the ability to turn it down. Although I wanted to have some overkill power I wish that once my chaeto is fully established I could maybe put it down to half power to reduce the heat put into the tank. Besides that the light has exceeded my expectations! if you are in need of growing some macro quick, quit thinking and buy this thing!! HI, I would like to buy one, but can you tell me more about noise level, thanks Nick. 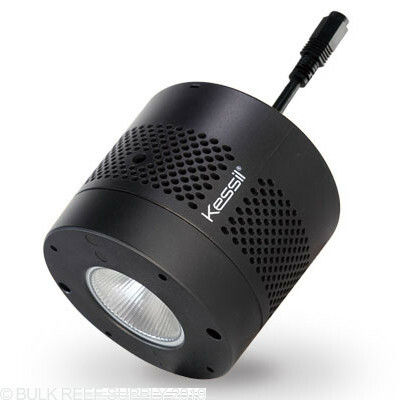 The Kessil H380 lights are virtually silent. I have a small separate refugium area with this light over it. I was considering adding a clam, but i was unsure if this type of light would support a clam. Any ideas? 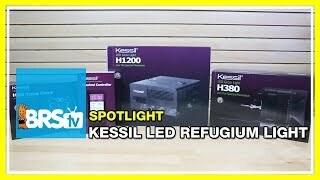 Do you recommend running light 24/7 (if used for refugium)? If not, I will need a separate timer? Thanks. We recommend 18 hours of maximum refugium lighting per day. A timer will be a perfect option for this! Is this available in white by chance? 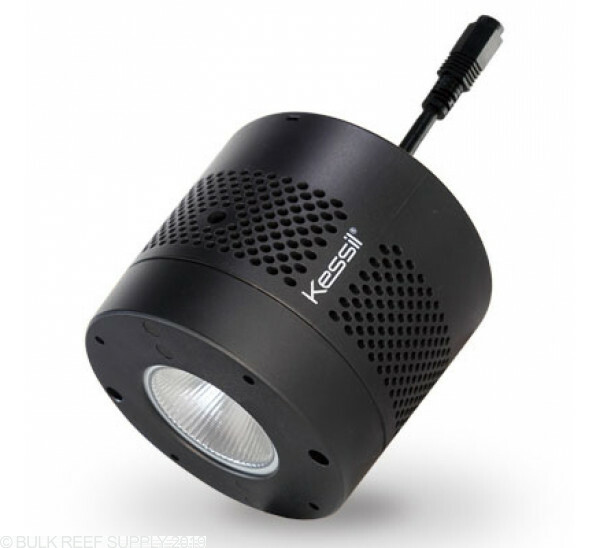 Right now, Kessil is only offering the black for this model. Does this light provide the spectrum of light needed to help maintain pH stability in the system when the Display tank lights are turned off? 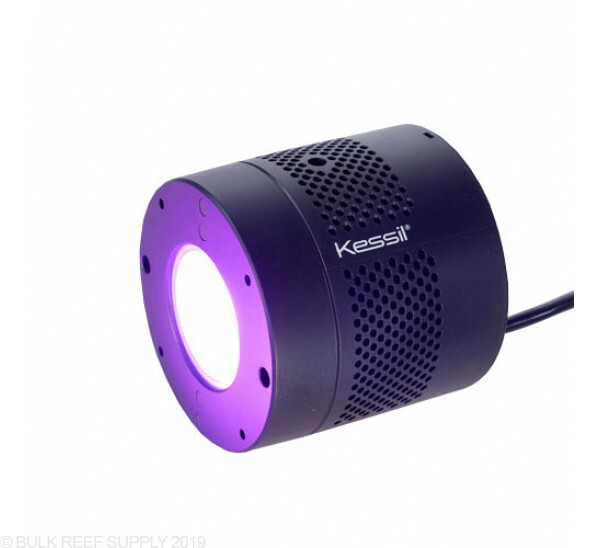 Looking for a light that can provide maximum algae growth and pH stability in the system, any suggestions? Great question and tough to answer! 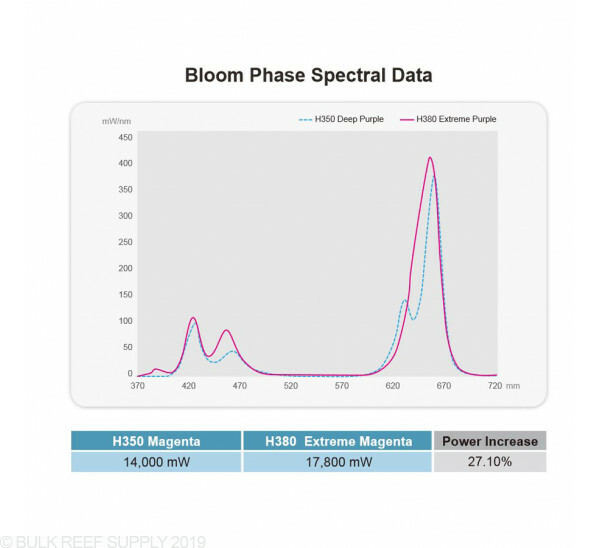 In short the light has been used on several of our tanks including the BRS 160 with success in keeping the algae growth constant without major pH swings between day and night. It certainly has worked on our systems but there are several other variable which can impact pH. Feel free to let us know if you have any further questions! Can this light be controlled with the Apex Neptune controller? Great question! 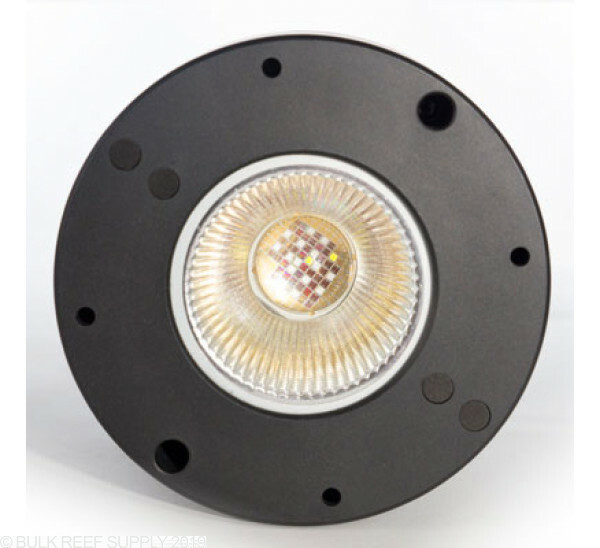 You will only be able to control the ON/OFF functionality of this light with the Neptune Apex. This does not work with the 0-10V variable speed ports. How is the intensity/spectrum controlled on this light? I plan to use it as a refugium light as suggested on BRS series but concerned about how close it will be hung (given stand height restriction) vs shallow refugium height. This light has a single knob to adjust the intensity of the fixture. 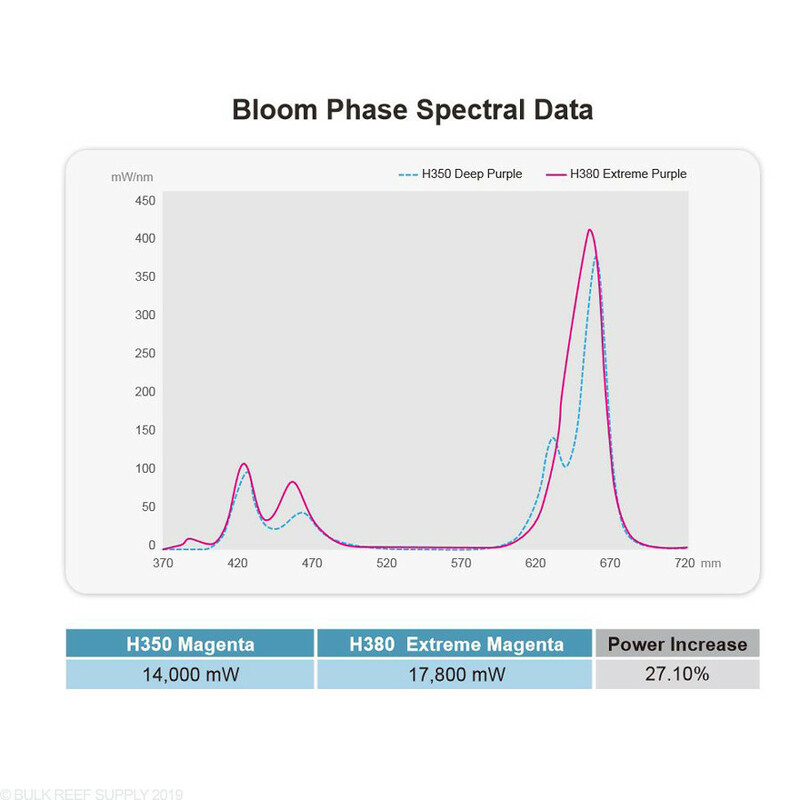 There is only 2 spectrums included the grow(recommended for algae) and bloom which is strictly used in hydroponics or plant flowering. Feel free to let us know if you have any further questions! My H380 came with an ac adapter that differs slightly from the manual specs. Can someone confirm this is the correct ac adapter? The power supply that was provided with your light is the correct AC adapter. 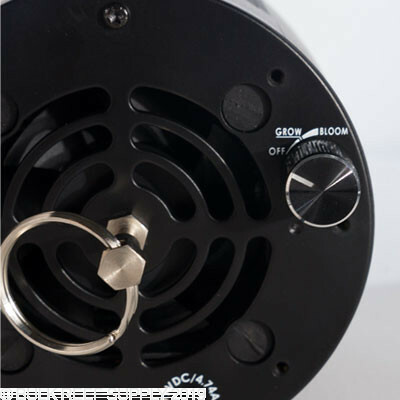 Manufacturers sometimes make small changes to the product and accessories after the manuals are printed. That adapter will work with that light with out any issues. I'm a bit new to the refugium setup within a sump. 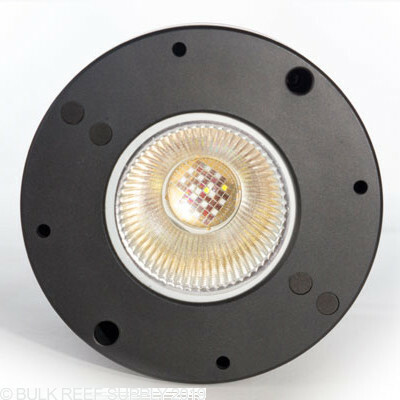 How would you typically mount a light like this to a refugium within an acrylic sump? Does it come with some kind of mount? Also, do you need to have dark panels separating the refugium from other sections of the sump so algae doesn't grow in the Protein Skimmer and Return sections of the pump? Thanks! 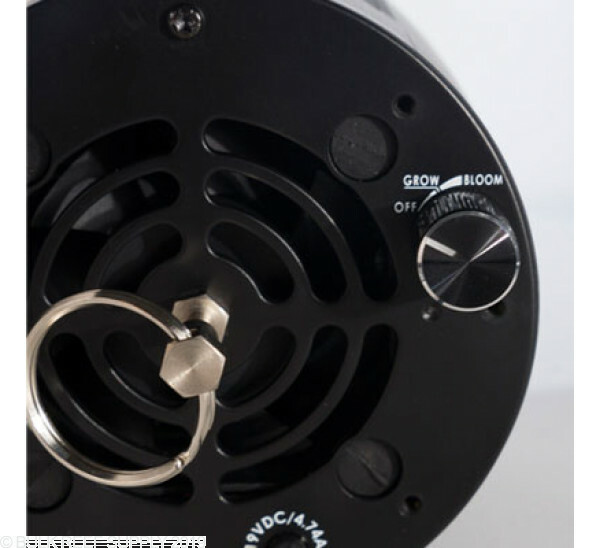 The easiest way to mount this light in most setups will be to use the gooseneck mount and clamp to the side of the sump. Great question! It is not controllable with the Apex nor the Kessil Spectral Controller.